If you think that the best approach to business is to be pragmatic, think again. Pragmatism is widely considered a virtue in business, but it is in fact a perilous approach, antithetical to long-term profitability. Pragmatism does have a positive connotation: it appeals to business people because they associate it with being practical and getting things done, which is a goal of business. While no-one would dispute that getting things done is good, first we need to ask whether being pragmatic really accomplishes that and what running a business for long-term success actually requires. Despite its positive connotation, the essence of pragmatism is expediency: abandoning principles—your integrity—to achieve immediate goals, such as winning a contract, closing a sale, or attracting investors. The pragmatist reasons: “The goal is to maximize profits now, so let’s be practical here. Competition is tough. To get that contract, to close this sale, to attract those investors, I must ‘embellish’ the facts to make my bid and my business look better than they are and also offer some kickbacks to the prospective clients’ representatives. Achieving my goal may require cutting some corners, but that’s what everybody is doing.” Engaging in this kind of ends-justify-the-means and everyone-else-is-doing-it rationalization, the pragmatist throws out the very principles the success of his business depends on, such as honesty, justice and independence. Pragmatism is impractical precisely because it advocates expediency over principles, the essential tools for getting things done for long-term profitability. A pragmatic, unprincipled approach can “get things done” for the short term. Deceiving potential clients or investors or winning a contract undeservedly based on kickbacks is a short-term gain but will unavoidably lead to a long-term loss. Just ask Bernie Madoff or anyone else who has attempted to sustain a pyramid investment scheme. (Madoff’s “short term” lasted for a relatively long time in terms of financial gains, but the price he paid in self-admitted mental anguish for years before getting caught speaks for the illusion that abandoning principles leads to values). Why do principles—general, fundamental truths induced from observation—trump pragmatism in business (and in life in general)? Using principles is superior to pragmatism in achieving long-term profitability and other values because that is the only way we can project long-term consequences of our choices and choose actions that lead to values in the long term. In contrast, being a pragmatist and acting on the spur of the moment (such as making an unrealistically low bid to win a contract) may give you a short-term gain (the contract) but a long-term loss (having to actually meet the contract, leading to further deception and eventually a failure, loss of reputation, and loss of the business). Why is using a principled approach so important? The fundamental reason is that we don’t know automatically what goals are needed to achieve the ultimate end of long-term success (long-term profitability, or survival and flourishing). We also don’t automatically know how to go about achieving those goals. (For evidence, consider the long history of business failures in contrast to successes, or mistakes and accomplishments of your own). Using principles is the only chance fallible beings have to make complex, concrete choices and achieve goals far in the future. Principles in all fields make this possible by allowing us to condense an enormous amount of information from observations by integrating it in a relatively few abstract, retainable statements. For example, “cultivate the soil before planting seeds”, “The form of an advertisement should not override its message,” and “Eat a balanced diet consisting of all food groups” are principles of agriculture, advertising, and nutrition, respectively. All allow us to project long-term consequences of our choices and to make concrete choices accordingly. 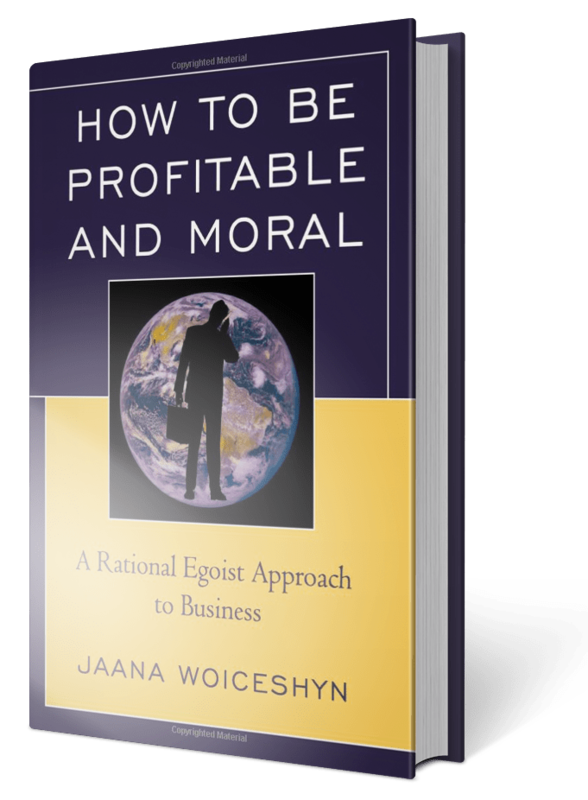 Moral principles are the most fundamental in guiding us to survive and flourish. As with all principles, only those moral principles grounded in observation of facts—the requirements of human survival and flourishing—are valid, such as honesty, justice, and independence. By projecting the long-term consequences, honesty guides us against faking facts (making an unrealistic bid) in order to gain a value (a contract). Likewise, justice guides us to evaluate people objectively, including ourselves, and not to give or take the undeserved (to not offer kickbacks to gain a contract). The principle of independence guides us to orient primarily to reality and not to follow others blindly. “Let’s be practical here” stems from evasion of facts—the requirements of long-term survival and success. When proposed, it must be challenged and rejected when evoked to abandon principles—if long-term survival and success in business and beyond is what we want. Excellent, as always, Jaana. Thank you!